Complete collection of 650 FED-STD-595C laboratory-grade Color Chips. 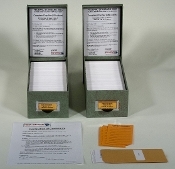 Each color sample is provided on a 3x5-inch card and packaged in an individual protective envelope. The full set is provided in a pair of fiberboard storage cases, suitable for bookshelf placement. FED-STD-595C Color Chips are suitable for Quality Control and Inspection purposes, as well as precise color matching. Chips are directly traceable to the US Government's master color reference, and a Declaration of Conformity is provided for the set. Change Notice 1 is fully incorporated. 3) The color samples in FED-STD-595C Fan Decks and Specification Document books are NOT approved by DOD for Quality Control Purposes. You may only use 595C Color Chips (either individual or from complete set) for Quality Control and precise color matching. 4) FED-SPECS' FS-595C Chip Set incorporates Change Notice 1 -- all 650 colors are included and correctly identified. 5) Many companies facing a Quality Audit also purchase the full FED-STD-595C Specification Document, along with complete chip sets. Frequently they are required to prove actual possession of the specifications with which they claim compliance.